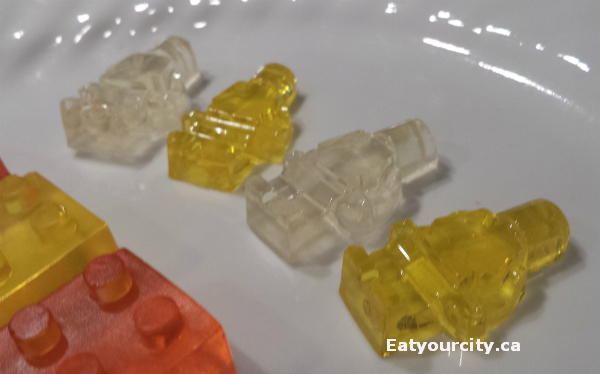 Eat Your City: LEGO gummy candies - tips, trick and video! Posted by Saw this on my Facebook feed a few weeks ago as a video by thekingofrandom.com was going viral showing folks how to make LEGO gummy candies! 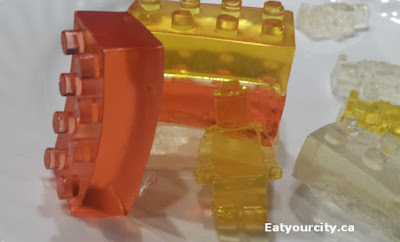 Hubby's brother's beat us to making them so here's their tips, trick and video on how to easily make these awesome candies you can play and eat! First off pick yourself up some silicone ice trays - silcone made it super easy to pop out the candies without damaging them. 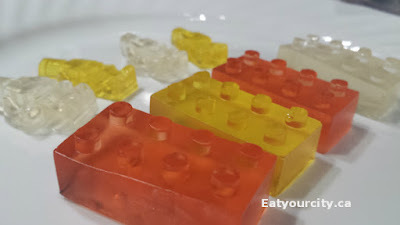 Hubby's brothers had LEGO brick ice trays and LEGO minifig ice trays from the LEGO store... I have some LEGO ice popsicle trays, DC Batman ice cube tray and even a Doctor Who telephone booth ice tray I can't wait to try out! Tip #2 - you can use any type of Jello or Jello-alternative brands of the wobbely fun gelatin out there. Hubby's brothers used Jello Lemon (yellow), Robertson's Lychee (Clear), and Jello Orange as they had it kicking around in the house. Tip #3 - Handle with clean hands or gloves as we've found even when kept in an air tight container, they only lasted about 3-4d at room temperature before they started to grow fuzzy patches of mold on them. And the awesome video from thekingofrandom.com!